Engage me.. don't just survey me | Jenkins Research Inc.
Just completed a post-service call online survey for my auto dealership. While there is technically, very little wrong with the survey, it served to remind me of the critical issues that all business must face when measuring customer satisfaction. The risk for companies is that the survey is transparently too much about the company and not enough about me. As a consumer, I am only modestly interested in the fact that the compensation for the service technician might be linked to the customer satisfaction scores. My motivation is more about (1) providing feedback that can be acted upon (so next time my experience is better) or (2) expressing my positive/ negative brand experience. In the auto dealer survey, I was asked to rate my satisfaction on a 10-point scale with seven things, plus several more overall indicators of satisfaction. The survey took about 5 minutes to complete. One of the interesting things is that if I happen to rate anything below 7 out of 10, I was asked to explain further my answer. This reflects the tendency in a Net Promoter Score world for companies to treat anything less than a 6 as a negative response. While companies may want to differentiate between a 7 and a 9, the reality is that I learned quickly that if I had an issue I wanted to note, I should give a 6 (or lower). Differentiation between 7 and 10 did not matter to me. The approach had one significant benefit over other surveys I have seen. In particular, allowing me to fully explain a low rating immediately ensured that the company was getting a clear sense of the pain points. Any transaction can be one of three things: especially delightful, uneventful, or problematic. The survey should ensure that each transaction can grouped accordingly but should take this into fact into account in the design phase. Clearly forcing me to evaluate each aspect of the service independently and to differentiate satisfaction on a 10-point scale does not reflect my interest in the service interaction. Since I was largely happy (it was uneventful), the survey could have allowed me to reflect this. I am not interested in doing the work to evaluate each element of the service breakdown and my answers are somewhat meaningless because of the uneventful nature of the experience. And, as an aside, really, how am I supposed to rate the quality of the work provided (unless the car breaks down a day after the work)? 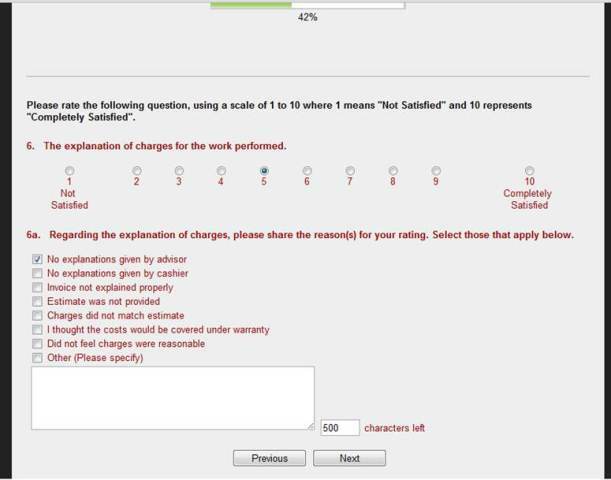 One of the stylistic issues with asking me to rate how satisfied I am with a fixed list, is that the survey feels like it is being motivated by the operational needs of the company. We did this, please tell us how we did is out of touch with contemporary culture. People are not interested in just rating the brands they deal with. They want to interact and possibly even co-create. The survey needs to be more carefully positioned so that the customer can see the survey as part of the overall customer experience with the brand — not just a narrow technical question of how good the service was. If the company had asked itself, what would a survey from our brand look like they would have served me with a better survey.